Consumer expectations are constantly changing across all industries. People expect fast, accurate information at the touch of a button, and customers are searching for products and services in more ways than ever before. Few have the patience to dive any deeper than the first page of search results, which is why results rankings are so crucial for brand exposure online. So how can your business stay ahead of the competition and in front of the consumer’s line of sight? Your organization can gain increased brand awareness, website traffic, and conversions by appearing on the first search results page through Google Ads. 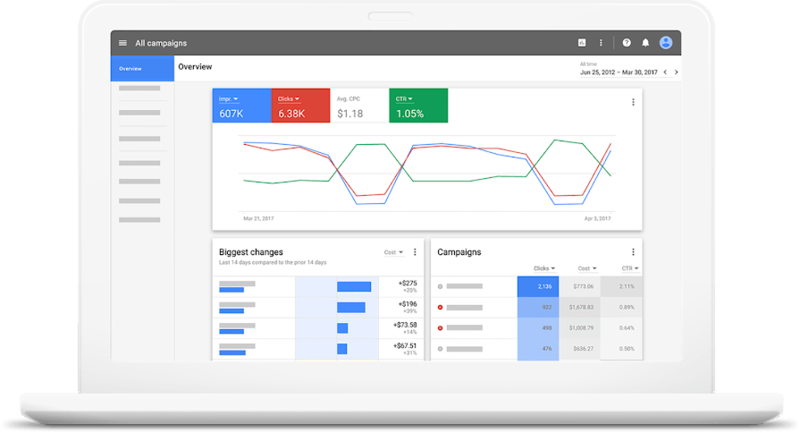 Google Ads, formerly known as Google AdWords, is an online advertising tool that allows your business to gain exposure across numerous devices and networks. The unique network options that Google offers include graphic display ads, YouTube video ads, text-based search ads, or in-app mobile ads, giving you plenty of ways to reach your target customer. If you use Google like the rest of the world (Google holds 74.5% of the global Search Engine market share, processing 3.5 billion searches everyday), you’ve probably seen sponsored search results before. They appear at the top, side, or sometimes bottom of the results page and are denoted by a small green icon that indicates you’re viewing a paid ad. Ads are intent driven. Your ads can appear if the words people type into the search bar match your list of pre-set keywords. Your keywords need to be relevant to the search term to appear. So, an effective Ads campaign relies heavily on understanding the customer journey and recognizing the intent behind why a customer might be searching for a particular keyword. Campaigns need a few basic elements to be effective. First, each campaign requires at least one Ad Group. An ad group organizes your campaign by containing only ads that share a common set of keywords. You determine the keywords you wish to target. For example, let’s say you run a local coffee shop. You might have one ad group for “beverages” and another ad group for “breakfast menu items.” Each ad group should then contain multiple ads that target the same set of keywords. The beverage ad group might target coffee, tea, and juice, while the breakfast menu items ad group targets bagels, egg sandwiches, and donuts. The keyword list in each ad group tells Google’s system to show ads for these products only in searches related to them. While you do have the freedom to lump all of your ads into just one ad group, your campaign will stay more organized and your results will be more effective following a segmented structure with multiple ad groups and multiple ads. We recommend creating at least three rotating ads per ad group. Remember that different ad groups should target different sets of keywords. The effectiveness of a Google Ads campaign is also based on the quality of the ad, the relevance of the ad copy, the landing page on your website, and your budget. One of the best budget-friendly features of an Ads campaign is that it follows the pay-per-click model, meaning that the total ad spend is based on clicks, not impressions. This means you only pay when someone actually clicks on your ad to get to your website. Each dollar spent drives traffic to your site. Ads campaigns are most effective when they are managed consistently and adjusted properly over the life of the campaign. Don’t Let the Details Scare You! Maybe our Google Ads breakdown made perfect sense to you, or maybe it seems like we’re speaking Greek. We get it. Ads is a fully-customizable tool that certainly has its intricacies. Don’t let the process scare you away from a potential opportunity to grow your business! Google Ads is a fantastic addition to any digital advertising campaign. Let Condron Media help your organization navigate through the fickle world of search networks and keywords with our digital marketing services.